Earlier on the day of the concert we were discussing the point of living with Jen. Especially if you don’t have any kids, or specific passion for any causes, or strong religious beliefs that give you purpose, or extraordinary skills or even defects that make you feel part of something bigger… If your life is just about working and ‘being’, without any clear plot – is there any point? 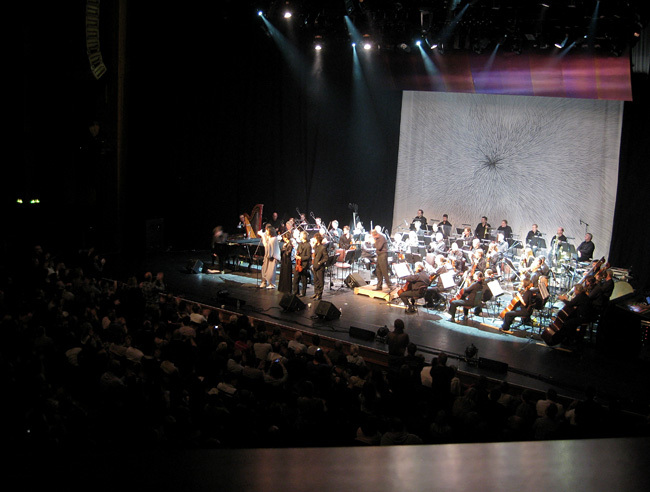 For my own part I can say that experiencing moments like Friday’s Antony and the Johnsons concert, is something that reaffirms my faith in being alive and in being part of the human race. When you get to, even for a fleeting moment, experience what some people are capable of, to be part of something so amazing that it actually lifts your soul – that, to me, is the point of living. I knew that we were in for something magical since I had already experienced being blown away by Antony and the Johnsons last year in Helsinki. But add to that the combination of a venue like the Barbican and the London Symphony Orchestra, and you get something almost unbearably powerful. The production was very low key in the way of stage activity, most of the time Antony stood in the dark, while his voice filled the auditorium. It was lovely to hear new material from him and I can’t wait to get to know some of the songs better. Last time I felt a bit uncomfortable with his live version of The Cripple and the Starfish, but this time, hearing it backed by the LSO, it was so beautiful it was almost too much to bare emotionally. Someone nearly passed out in the front row and I found tears were falling down my face at the end of it without me even realising. I now wish I’d seem him on both nights of performances at the Barbican. I wish I could always and forever to be in that state of mind where you feel the human race is capable miracles. Filming was strictly verboten, so unfortunately there’s no video to show you. It’s kind of a scary thought that something like that will only stay alive in my memory… for as long as my memory serves me. Somehow I feel it should be recorded somewhere for safekeeping, but then again, there’s always that certain something missing from a recording. The ‘moment’, the magic of live music. I did sneak this one picture during the final applauses. Hienoa! Mielestäni elämässä ei tarvita mitään Suurta Tarkoitusta jostakin ulkopuolelta, jotta elämä olisi jotenkin enemmän elämää (sanoo hän, jolla on lapsi ja toinen tulossa, ja jonka elämä oli oikeaa elämää ennen niitäkin). Elämän tarkoituksen voi myös huomata hetkellisissä oivalluksissa, jotka saavat tuntemaan elämän elämisen arvoiseksi. Eipä sen kummempaa. Kuvasi ovat muuten viime viikkoina olleet ihanan syksyisiä, surumielisiäkin, mutta samalla hyvin lämpöisiä ja kodikkaita. Ne ovat myös hellineet melankolista sieluani. Pahastutko, jos käytän niitä läppärini taustakuvana fiiliksen mukaan? @kirsi: Joo, niissä pienissä hetkissähän se on… se vaan usein unohtuu kaikessa kiireessä.